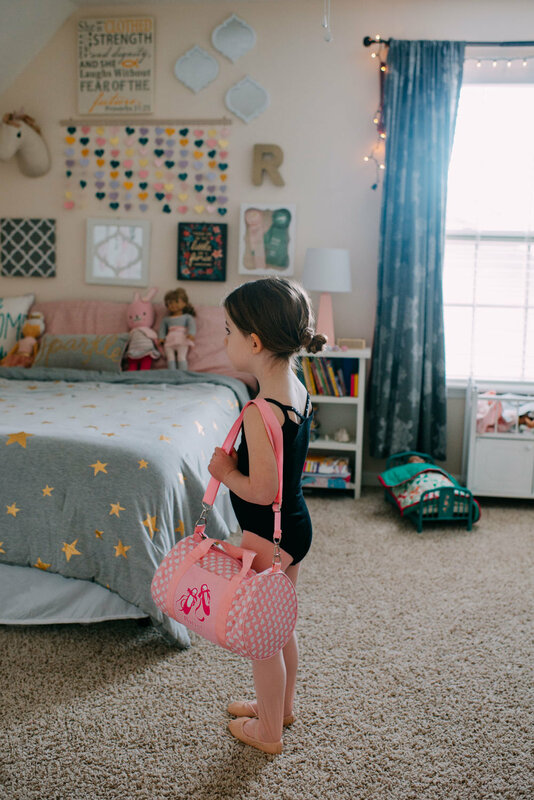 I'm experiencing all the Mom emotions over here as I sort through these images and work through what exactly brings me to tears and what is making me jump for joy with my 4-year old daughter starting ballet. She begins classes tomorrow and this is the most excited I've ever seen her. When we bought the black leotard, pink tights, and ballet shoes, it first brought me back to MY ballet classes. I don't remember them super well, but I can see myself running through the large studio, practicing simple plies, and the first [and only] recital I did. I don't recall why I didn't want to continue with classes, other than maybe I was more into horses and was trying a LOT of different sports at the time. Reese right now, has it made up in her mind that she will be a dancer and perform on stage, and hey, maybe she will! Before taking these photos, I opened Spotify and put in "ballet music." Reese immediately began to twirl and spin and attempt her own versions of plies and grand jetés. She was so serious and yet having so much FUN all in one. I feel so much pride in her, and as her mom, am so excited to see how this helps her grow and change. At the same time, I see a little girl who IS going to struggle with failure, difficulties, and perhaps even have her feelings hurt within the sport. I know, I know, she's FOUR. The other little girls in her class will be so sweet and having so much fun, but as a woman who participated in sports, starting at very young ages, it's hard to accept the hurt that eventually, my baby WILL walk through. If you ever did sports, do you remember the times you felt insecure? Not good enough? Ashamed? I started volleyball in the fourth grade, and it wasn't too many years later that my uniform was skin tight miniature spandex shorts. In high school, I was a tanning bed babe, obsessed with getting golden brown for those fluorescent gym lights, and I was always insecure about my thighs touching. So yes, I realize that Reese is four. But it won't be too much longer before she's fourteen, and I know that insecurities and feelings of doubt begin MUCH before then. I took these photos of my beautiful baby girl dancing and LOVING being in her ballerina outfit because I wanted to remember this moment. This season of life she is in, where she doesn't know where insecurities are, what shame looks or feels like, and while she believes she IS beautiful because she is. I so hope that I can instill in her courage, bravery, and the strength to put aside negative feelings and hurtful people. My high school insecurities didn't last forever, but they were still there, and those years weren't exactly easy. Maybe Reese will experience them, maybe she won't, and maybe I need to also pray that I am strong enough to guide her regardless. Reese Elisabeth-Morgan, OH how I love you! What a magical season of life you are in right now. I cannot wait to watch you dance and make new friends. You are a light and a bundle of strength and laughter. If you want to dance throughout your years, I will be so elated to watch you. Smile, always, because Daughter, you are radiant and you are so loved. PS: Yes, I know her strings need to be cut on her ballet shoes. I'm totally going to let her teacher help me tighten them and fit them accordingly. Also, here's a photo of me in my dance years, or should I say YEAR. Thanks, Mom for sending it!